Edelweiss Chicago is the first Gauverband member Verein to turn 100 years old. To commemorate this milestone, Gauverband Nordamerika has designed a beautiful pin. Although Edelweiss Chicago is not specifically referenced, the Edelweiss flowers on the side and the Tracht worn both point back to the Verein. The delegates to the 2012 Delegates Meeting approved the plan for a pin. After that, the design was roughly sketched out, then modified by the Gau-Ausschuss. 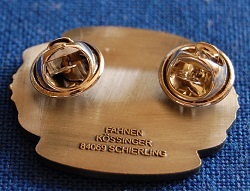 After a design was agreed upon, Paul Ulrich contacted Fahnen Kössinger to finalize the sketch, get prices, order the stamping of the pins, and make all other arrangements. As you can see, the quality is top notch. 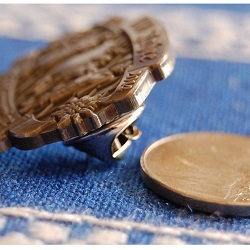 The thick pin, made of heavy metal, measures 1.5” across and 1” high. Two butterfly pin backs will hold the pin securely to hat or Joppe. Its a pin to be proud of and a milestone to be proud of. 2,000 pins have been ordered and will be available at the Delegates Meeting in May. At only $10 each, every Trachtler who wants one will be able to afford it. 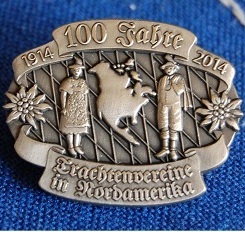 What a great way to commemorate the first century of Trachtenleben in Nordamerika! The pins will be sold through the Gauverband Librarian, Michael Rase. It is suggested that you put in a group order in advance with payment and pick up at the Delegates Meeting. If you are not coming to the meeting and would like to order one or more pins, please contact Michael to find out about payment method and shipping costs at 303-619-3248 or bayerish@gmail.com. These pins would make great gifts and also “Mitbringsl” for anyone going to Bavaria for a visit or taking part in the Oktoberfest. It represents us and our history well.